A binary option trader should be competent enough to identify and trade both reversal and continuation patterns. The reason is that a trader may not come across a reversal pattern always. After a prolonged uptrend or downtrend, the price of an asset may halt temporarily and form congestion zones because of the equilibrium attained between the buyers and sellers. The range bound price movement within the congestion zone may create unique chart patterns, which indicate the possibility of continuation of the prior trend once the price breaks out of the pattern. A Flag is one such continuation pattern, which can develop after a steep rise or decline in the price of an asset. Being a frequently seen chart pattern with high reliability, a binary options trader should not miss the opportunity to capitalize on the impending price movement. 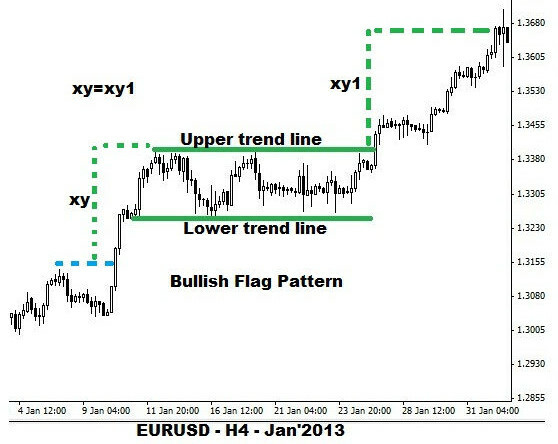 The rectangle shaped flag pattern usually develops near the center point of an uptrend or downtrend in price. The pattern begins to develop with a steep rise or decline in a security’s price. The abrupt price movement resembles a flag pole. A consolidation (range bound movement) process follows the steep (rise or decline) price movement. This results in the formation of a rectangle or flag shaped pattern. 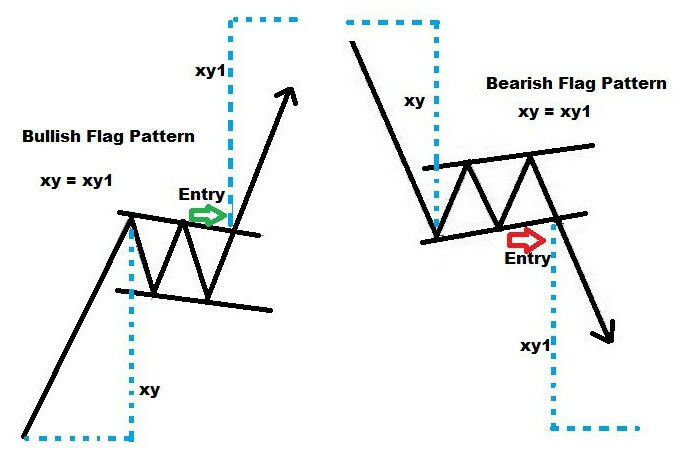 A Flag formation can be considered as bullish or bearish depending on whether the pattern develops after a sharp rise or decline in the price. Additionally, the continuation pattern indicates that the prior uptrend or downtrend would continue once the consolidation process gets over. 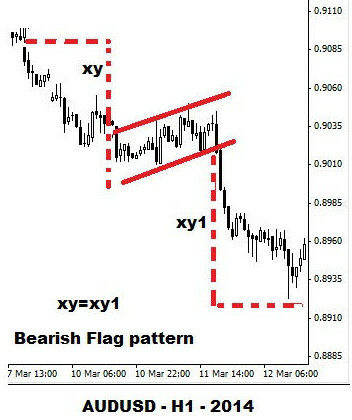 In the case of a Flag pattern, two trend lines running parallel to each other are drawn by connecting the reaction lows and highs. Usually, a bearish Flag pattern will be slightly tilted upwards and vice versa. A Flag pattern takes one to three weeks to develop. Once the flag pattern is broken, the price continues in the prior direction and attains the target quickly. Thus, the price breaks above the upper trend line in the case of a bullish Flag. On the other hand, price breaks below the lower trend line in the case of a bearish Flag pattern. The length of the flagpole is calculated and added (bullish flag) to or subtracted (bearish flag) from the break out price to arrive at the probable price target. There should be a sharp rise or fall in price before the formation of a Flag pattern. The volume should increase during the formation of a flag pole. Once the price starts consolidating, the volume should decrease. The volume should increase considerably when the price breaks out of the trend line. A binary options trader can purchase a 1min / 30min / 1hr call options contract once the price breaks above the upper trend line of the Flag pattern. The volume should be on the rise during the break out. Additionally, the momentum should remain strong. The price would continue to move up as long as there is no change in the volume and momentum scenario. A retracement caused by unexpected news would push the price below the upper trend line thereby making the options expire out of money. Since the price would move sharply after the break-out above the upper trend line, a trader should be ready to purchase a suitable binary options contract without any delay. 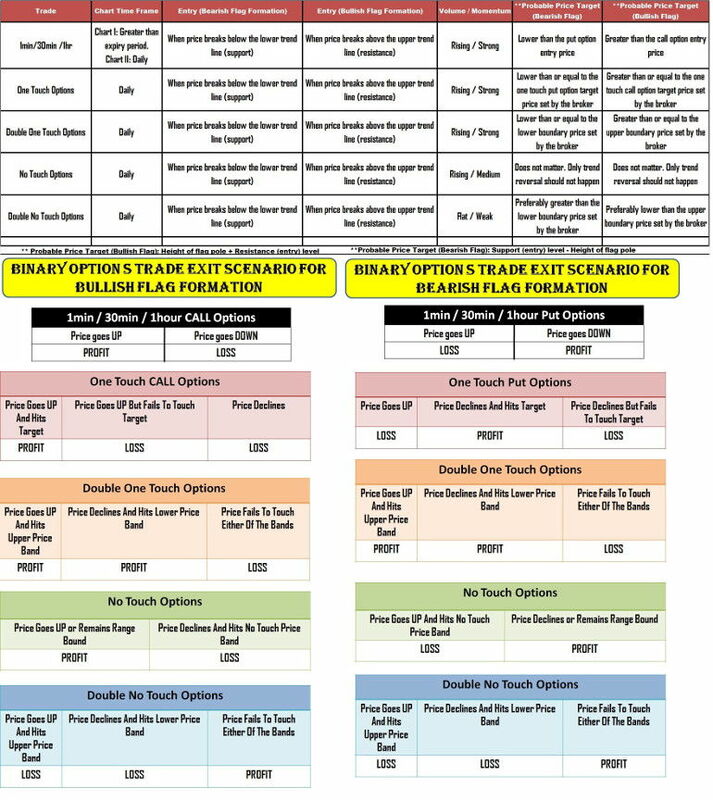 A one touch call options contract can be purchased if the probable target price calculated using the length of the Flag pole is equal to or greater than the target price set by the broker. The only rule to be satisfied is that the volume and momentum should favor a strong rise in the price of the underlying asset. The contract will expire out of money only if unexpected negative news triggers a trend reversal. A binary options trader should consider purchasing a double one touch options contract only if there is a scheduled high impact announcement. If the news is favorable then the price would continue to rise and hit the upper price band target set by the broker. On the other hand, unexpected negative news would trigger a reversal, which would push the price below the lower price band target set by the broker. If the news halts the price movement then the options contract will expire out of money. Even in the case of a double one touch options contract, the volume, supported by a strong momentum, should increase during the break-out above the upper trend line. Additionally, the probable price target should be comparable with the upper boundary price target set by the broker. A ‘no touch options contract’ is the best possible solution for trading a bullish Flag pattern. Once the price breaks above the upper trend line, a no touch options contract can be bought. As long as the momentum is strong and the volume remains considerably higher during the break out, the probability of a reversal below the upper trend line is negligible. Only unexpected negative news can make the contract expire out of money. Since there is no target price to be achieved, a trader need not give importance to the probable target price calculated using the length of the flag pole. During the break out above the upper trend line, the volume is not rising and the momentum is weak. There is no high impact news announcement to be made before the contract’s expiry time. As long as the trading of the underlying asset remains lackluster, the price will not breach either of the price bands set forth by a broker. Any unexpected developments (economic or geopolitical) would increase the volatility thereby resulting in a loss. When a binary options trader comes across a bearish Flag pattern, a put options contract should be purchased instead of a call options contract. Thus, after assessing the prevailing situation, a price break-down below the lower trend line should be used to purchase a 1min/30min/1hr put options, one touch put options, double one touch options, no touch options or double no touch options contract. It should be remembered that devoid of double no touch options, the volume should be rising for all other contracts. Additionally the momentum should be strong as well. A trader should develop the ability to spot a bullish and bearish Flag, which is a vital continuation pattern. Only then binary options trading can be an enjoyable experience.